I don’t want to be sat here romanticising anything but as I’m writing this the sun has started to come back out. My spirits are lifted and I’m thinking about all the amazing times we can spend as a family in the garden again. My two boys are huge garden fans. I mean its where all the dirt can be found after all. Our outdoor space isn’t massive but it has enough room for the usual football goal, trampoline and play house. 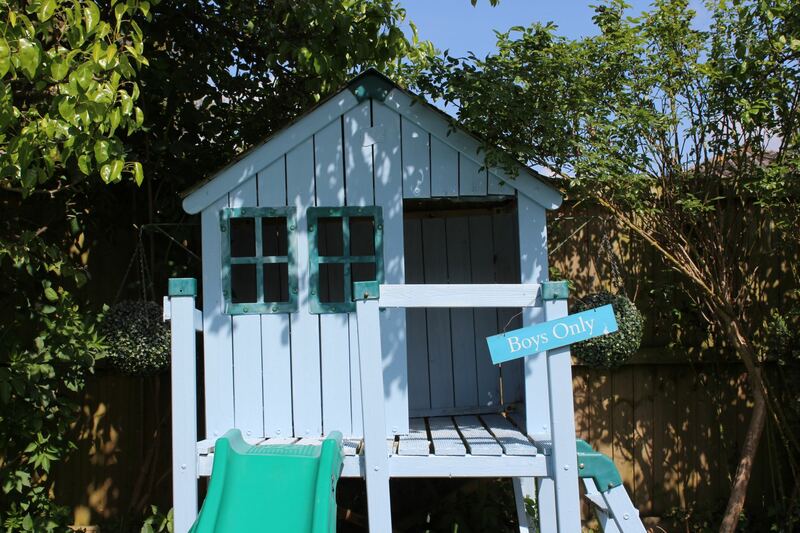 I would love to replace our tatty playhouse this summer and have my eye on this amazing one here. For me, keeping the children entertained is always such a task. Ive no idea whether its because I’ve not encouraged playing alone enough or if they struggle with imagination. I’d like to think its because I just have the best ideas and I’m the most fun. Either way I now have a fail safe list of things to do in the garden. Huge sets of chunky chalks are fab because the children can draw (or learn spelling if you’re a pushy mum like me) and then have all the fun of just hosing it all off again! Its also great to write the alphabet on the ground and shout letters or numbers out for them to jump on. Seems like such a simple idea but my boys love it. If I’m just playing with my youngest I tend to use shapes as he finds this a little easier to know where to jump. I have acquired loads of small paint rollers since we have moved into our house. We always buy a set and then only use the larger ones. So when its lovely weather the boys use the rollers and water to paint race tracks on the ground. I love any game that requires zero cleaning up when they are done! Finding leaves and twigs around the garden to create a picture with later. There is often a way to tie this into whatever topic they are learning at school which is a Brucey bonus! I really try to encourage my boys to be creative as they tend to focus on sports the majority of the time and I love to keep their options open. 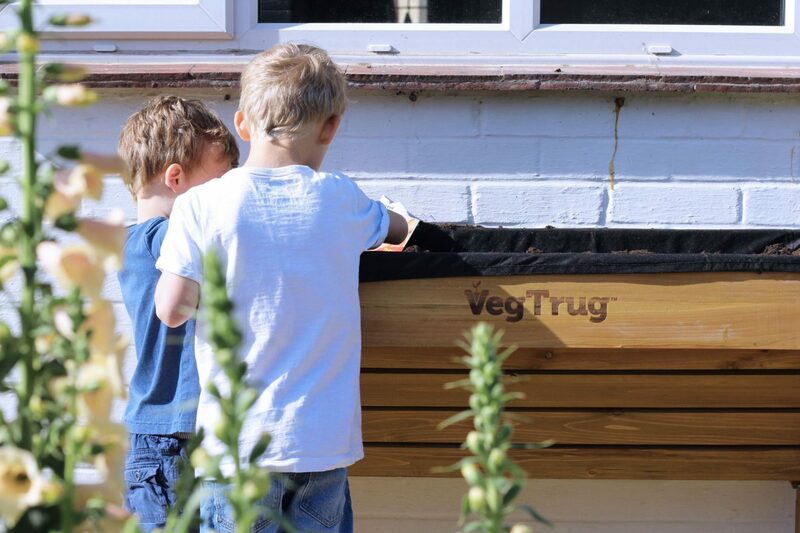 We have a VegTrug and the boys have started to grow their own veg. 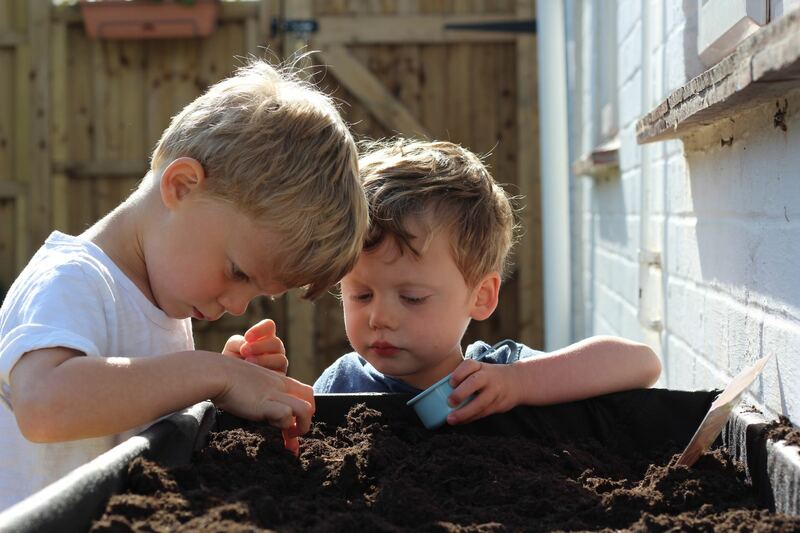 They were so excited to plant the seeds and its such a low maintenance way to get them to enjoy gardening a little bit. It was like Christmas when the seeds popped up! Creating your own mini sports day with various jumping/running/catching competitions can be so much fun. Especially if you take on the role of the person who keeps score, aka sitting down with a cold drink while they do all the energetic fun! This is a game that you can dabble in or go all out. I love to just bring the boys wigwam into the garden and maybe let them eat their lunch in it. Im a dabble camper. If you are the all out camper then why not make a pretend camp fire and pretend to toast marshmallows, sing songs and tell stories and maybe just maybe, stay up a little later and look at the stars. If imagination isn’t your strong point then I’d always recommend some old faithfuls that are great for adults too. Let me now if you have any great ideas for keeping littles entertained! *This is a sponsored post in collaboration with Wayfair. 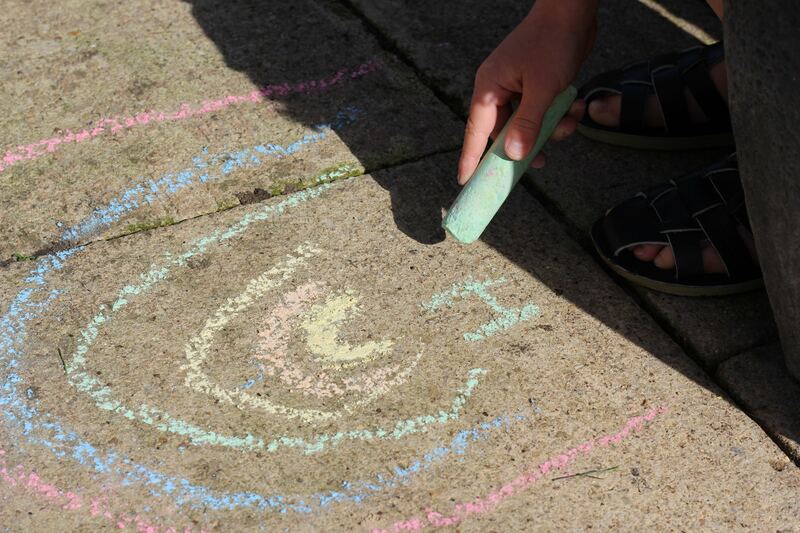 My 2 boys love chalks and get loads for £1 in our poundshop! Bargain. My little one just adores bubbles he is slightly obsessed so we have a bubble machine and even my eldest loves jumping to pop the bubbles. Painting with water is a brilliant idea! Off to the shops tomorrow for paint rollers, that’s such a brilliant, simple idea! Might also purchase a cheap tent for the garden – we’ve never done proper camping (probably never will!) but I like the idea of a garden tent for summertime fun.